Stardust will take you on a journey through time and space, into a land where only the purest and daintiest of creatures are free to roam. This exotic and mystical slot game is absolutely jam-packed with spectacular prizes and huge rewards. The Fairies of this absorbing slot game invites you into their blissful realm to bask in the treasures, and reap the ever-lasting rewards that come with helping them fight off evil spirits, and defend their sacred kingdom. 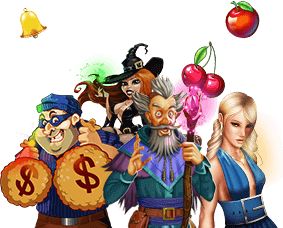 Stardust features enticing free games, with an expanse of enthralling payline combinations, scatters and wilds! Stardust is the hottest new 5-reel, 243 fixed-payline slot, which features the Green Fairy as the wild symbol and a 50-line bet possibility. Three or more Willow scatter symbols trigger the re-spin feature, each unlocking free games, spins and the chance to unlock additional bonuses. Each free game feature gives players a chance to multiply wins with the appearance at least one wild symbol, and the chance to earn exciting re-spins and staggering prizes! All symbols pay Left to Right except scatters, and the top reward is 2,000 times the bet per line. Treasures and glistening prizes await with the magical Stardust! Once you’ve had enough fun practicing on Stardust for free, you should kick it up a notch and opt to play for real money! Sign up with a $50 deposit and enjoy a 250% No max Bonus with 5x playthrough and 50 Free Spins or deposit $75 and you’ll receive a 275% No Max Bonus with 5x playthrough and 50 free spins. Just use the coupon STARDUST. Stardust is a 5-reel, 243 fixed payline online slot, which gives you plenty of chances to win free games and prizes on every turn. You can change the paylines from 1-20. The coin size is also adjustable, allowing you to customize the bet size to suit your bankroll. Stardust is designed to accommodate both penny slot enthusiasts and those who like to spend a little bit more on each spin of the reels. A 5-reel title with 243 paylines makes it possible to keep the wagers for the game low or go high if your bankroll allows. The Autoplay feature is convenient and easy to use; just set a bet level, determine how many spins you want to play, and enjoy watching as your prizes and free games continue to increase. Wild Symbol: Green Fairy Green Fairies are Wild and count for all symbols except scatters - Green Fairies may morph into Blue Fairies before pays are awarded. Blue Fairies are Wild and count for all symbols except scatters. - The prize is x4 when a Blue Fairy appears in a win. Scatter Symbol: Willow 8, 15 or 50 free spins are awarded when 3, 4 or 5 scattered Willows appear in a normal game. Up to 50 Free Games are awarded when 3 or more scattered Willows appear, with every Free Game featuring a Wild Reel.